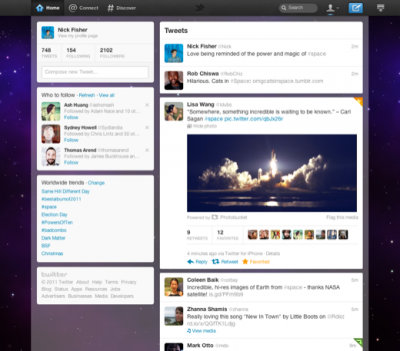 The new Twitter interface, courtesy of fly.twitter.com. Twitter’s slick new redesign has brought it – visually and practically – closer to China’s most dynamic microblogging platform, Sina’s Weibo. It shows, perhaps, that Sina’s rapid rate of change on its most popular service is now actually leading the way for Twitter. How the tables have turned! The post goes on to explore how Twitter is now implementing new features like customized brand pages and embedded media and photo albums that have long existed in Sina Weibo. As an avid user of both networks, I realize they have substantially different needs and contexts (one important distinction: Twitter is the undisputed leader of microblogs in the West, whereas Sina must compete with Tencent as the reigning microblog platform in the Chinese-speaking world). Of course, Twitter still remains a vastly different user experience from Sina Weibo. With fewer bells and whistles, it skews toward minimalist features. But I’m glad to see some convergence in terms of features. Native emoji support on the iPhone will be available as an international keyboard. Image from apple.com. Outside their native Japan, emoji have been available to in-the-know smartphone owners for some time via add-on applications. But now they may be on the verge of going mainstream in the United States, thanks in part to Apple’s latest update to its iPhone software. 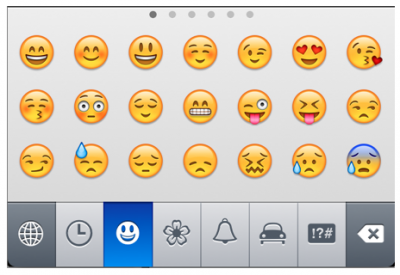 The latest version, iOS 5, comes with an installed library of emoji that can be turned on as an “international keyboard” in the device’s settings. Yes, emoji come from Japan, but anyone who’s been using Sina Weibo and Tencent QQ for a while now know that animated, expressive emoticons have long been a mainstay of Chinese social media (and according to Mimi Ito, the researcher quoted in the article, they’ve been in Japanese social media since the 1990s). They give color and light to text in an already rich multimedia environment and allow for more nuanced expression of nuance outside of straight text. 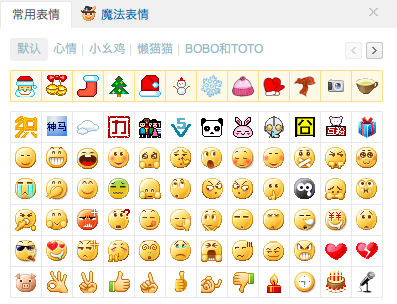 This is just the first page of Sina Weibo's vast array of expressive icons. It’s interesting to think of China, and Asia generally, as leading a trend in social media interface design. Whereas Twitter has relied largely on text, and Facebook has relatively recently opened up to the idea of high resolution images, mainstream Chinese social media platforms have long relied on multimedia features to liven up the experience. Just witness the growing popularity of Instagram. Cultural tastes vary, of course–it’s hard to imagine Westerners loving the feature-rich options of Sina Weibo, or Chinese enjoying the minimalist features of Twitter. But social networks with rich visuals simply look better and are more fun to use. All the iOS 5 Emoji keyboard emoji are characters in the Unicode Character Set. Characters just like a or b or c. All the major platforms use Unicode and so once they catch up with Apple these emoji will be universally usable and usable in any App. Lets take the top left Emoji from your iPhone keyboard image, above. It is the Unicode character U+1F604 (Unicode codepoint) SMILING FACE WITH OPEN MOUTH AND SMILING EYES (Unicode name). Next post Is China a Telecom Bridge to North Korea?